Record breaking day at Top Times! On Saturday, March 27, fifteen members of the DGS girls track & field team traveled to Illinois Wesleyan University in Bloomington to compete in the Illinois Top Times meet. 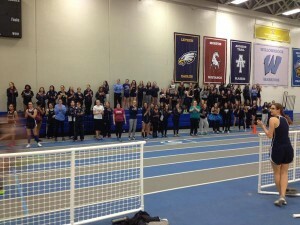 Those fifteen girls represented DGS in 10 of the 16 events competed. Depending on the event, only the top 12-25 girls in each event are invited to compete, so just getting the opportunity is quite an honor. Our Mustang athletes took advantage of that opportunity, recorded lots of great times, distances, and PR’s. Several records were also set in the process. Shaliyah Dixon-Tucker (Sr) staged her own coming out party on Saturday. She won two different events and placed well in two others. Shaliyah started the day by dominating the prelim heats of both the 60m hurdles and the 60m dash. Her 60m hurdle time of 8.65 was the fastest time in Illinois this season and a new DGS indoor record. Her 60m dash time of 7.50 was not only a DGS indoor record, but a Top Times meet record and the #1 time in Illinois this year. These two races were run about 15 minutes, making the feat even more unbelievable. While Shaliyah ran slightly slower times in the finals of both events, they were still fast enough to win both events in impressive fashion. Just as impressive was the performance of Michaela Hackbarth (Sr) in the 800m run. As the defending state champion, she will be the favorite in most races she runs this season, and it was especially obvious on Saturday. Michaela won the 800m in 2:12.26, winning her race by 4 seconds, setting the #1 time in Illinois, and breaking her own DGS indoor school record. Like Shaliyah before her, Michaela had a short turn around before she competed again in the 400m dash where she placed 6th overall in 58.82. Her 400m time was only 0.24 seconds away from the DGS record set by Olympic triple jump hopeful, Tori Franklin ’11. Maddie Manganiello (So) placed 6th in the long jump with a jump of 17′ 11.5″. The springy sophomore set a PR and eclipsed the DGS F/S indoor record. She will have two more years to close in on Tori Franklin’s varsity record of 18′ 1″. Soren Umali (Jr) was the 2nd DGS athlete competing in the 60m hurdles. Soren’s prelim time of 9.11 was a PR and helped her earn a position in the finals and where she placed 6th overall. Katie Stapleton (Jr) ran a good 3200m race in 11:11.64 to place 8th in the field of 15. Katie had already set the DGS indoor record by running 11:02 a couple of weeks prior. She will be looking to become the 3rd DGS athlete ever to break 11:00 once the outdoor season begins in earnest. Becky Versaskas (Fr) gained some valuable experience competing in the 800m and placing 8th in 2:19.60. Her time just missed the F/S indoor record of 2:19.52 set by former Missouri State athlete, Nicole Thate ’09. The talented and versatile freshman has proven to be extremely competitive in all 3 distances (800, 1600, and 3200). The 4x800m relay team of Kelley Hackbarth (So), Maggie Seitz (Sr), Kara Petersen (Jr), and Gillian Thomas (So) held their own against a talented Top Times field, placing 11th overall with at time of 9:58.99. Three out of the 4 girls ran season best 800m splits. The 4x200m relay team placed 2nd in their heat and 7th overall. The sprint quartet of Umali, Nicole Muccianti (Jr), Arianna Finely (Sr), and Dixon-Tucker ran a season best time of 1:47.66 in doing so. Dixon-Tucker came back to win her heat of the open 200m dash in 25.61 and place 4th overall. Her time was a new DGS indoor school record, breaking the 25.64 mark set by former DGS head coach and Olympic athlete, Egle Staisiunaite ’07. The 4x400m relay team closed out the day by placing 4th overall with a season best time of 4:05.00. Lauren Wong (Sr) led off the relay, handing off to Sonja Renowden (Jr). Those two sprinters waited nearly 7 hours to compete before handing off to Becky Versaskas and Michaela Hackbarth to complete the relay and the meet. Author Coach PlunkettPosted on March 30, 2016 Categories Track & FieldLeave a comment on Record breaking day at Top Times! Illinois Top Times Meet Results! Full meet results for the March 26, Illinois Top Times meet can be found HERE. Author Coach PlunkettPosted on March 27, 2016 Categories Track & FieldLeave a comment on Illinois Top Times Meet Results! DGS taking 12 events to Top Times meet! The Downers Grove South girls track & field team will be taking girls to compete in 12 events at the Illinois Top Times meet on Saturday, March 26. The meet will be held in the afternoon/evening at Illinois Wesleyan University in Bloomington. Athletes qualify to compete based on results from throughout the indoor portion of the season. The top 12-25 athletes in each event are invited to compete at what is considered to be the unofficial indoor state meet. You can read Mike Newman’s preview of the meet HERE. Michaela Hackbarth (Sr) and Shaliyah Dixon-Tucker (Sr) lead the Mustang contingent with some of the top marks in the state. Hackbarth will compete as the favorite in the 800m run with the fastest indoor time so far (2:14.57). Dixon-Tucker has BOTH the best 60m dash seed time (7.59) and 60m hurdle seed time (8.82) among all competitors. Hackbarth will also compete in the 400m dash (59.48) as the 10th seed out of 16 runners, while Dixon-Tucker will return to the track in the 200m dash (25.66) ranked 5th out 16 runners. Maddie Manganiello (So) will be the first DGS competitor in the meet when she jumps in the Long Jump competition early in the afternoon. Maddie’s 17′ 8.5″ mark is 9th among the 12 qualifiers. Katie Stapleton (Jr) will be next up on the track as she races the 3200m run. Katie’s time of 11:02.09 seeds her 6th out of the 15 qualifiers. Soren Umali (Jr) will join Dixon-Tucker in the 60m hurdle race where her 9.16 seed time ranks her 7th out of 25 hurdlers. Becky Versaskas (Fr) will join Hackbarth in the 800m run with the 11th best time (2:21.00). The Mustangs will also be represented in all three relay races. The 4x800m relay team of Kelley Hackbarth (So), Maggie Seitz (Sr), Kara Petersen (Jr), and Gillian Thomas (So) will take the track among the field of 12 teams. The 4x200m quartet of Umali, Nicole Muccianti (Jr), Arianna Finley (Sr), and Dixon-Tucker will race as the 10th seed out of 16 teams. The final race of the evening will feature the 3rd seeded 4x400m relay team of Lauren Wong (Sr), Sonja Renowden (Jr), Versaskas, and M.Hackbarth. Downers Grove South has a rich history of competing well at this meet over the years. You can see Top Times results from past meets HERE. Good luck to the Mustangs as they wrap up the indoor portion of the schedule against some great competition! Author Coach PlunkettPosted on March 24, 2016 Categories Track & FieldLeave a comment on DGS taking 12 events to Top Times meet! You can access pictures taken at the March 18th WSC Indoor Conference Championship (courtesy of Laura Duffy) on the Pictures and Video page. Author Coach PlunkettPosted on March 22, 2016 April 8, 2016 Categories Track & FieldLeave a comment on Conference Pictures! Girls Track wins 12th straight conference title! The DGS girls track & field team won the WSC Gold Indoor title for the 12th straight season Friday night. Full team scores from both varsity and frosh/soph levels can be found HERE. Shaliyah Dixon-Tucker (Sr) led the Mustangs with 4 individual victories. Shaliyah took 1st in the high jump with a 5’0″ effort. Then she took to the track in record-setting fashion. Shaliyah won the 55m dash in 7.04, a new conference record, as well as DGS school record. Currently, that is the fastest time in the state! She came back a few minutes later to win the 55m Hurdles in 8.20 which is also a new conference record and state leading time. Shaliyah finished off her day by winning the 200m dash in 26.01. Michaela Hackbarth (Sr) won 2 events, placing 1st in the 800m (2:28.41) and 15 minutes later, 1st in the 400m dash (59.96). Other DGS varsity conference champions were: Katie Stapleton (Jr) in the 1600m run (5:21.85), Becky Versaskas (Fr) in the 3200m run (11:27.80), and Maddie Manganiello (So) in the long jump (17′ 7″). The Mustangs won two of the three relays as well. The team of Maggie Seitz (Sr), Jill Boyle (Sr), Liz Alcantara (Sr), and Kara Petersen (Jr) won the 4x800m relay with a time of 10:22.03. The 4x160m relay team of Soren Umali (Jr), Nicole Muccianti (Jr), Lauren Wong (Sr), and Arianna Finely (Sr) took 1st place with 1:26.06. On the Frosh-Soph level, Alexus Allen (So) led the way with 3 individual victories. Alexus won the long jump with 15′ 11″, setting a new indoor conference record in the process. She also won the 55m dash in 7.96 and the 200m dash in 28.34. Izzy Taylor (So) won both the pole vault (6′ 6″) and the 300m dash (45.33). Kelley Hackbarth (So) was also a double winner, taking 1st in the 800m (2:37.34) and the 400m (1:04.92). Alyssa Taglia (So) won the 1600m run with 5:46.68. And Olivia Duax (Fr) won the 3200m run (12:06.21), which was a new indoor conference record! The F/S team also won two relays. The team of Teagan Halik (Fr), Johanna Skibbe (So), Riya Bhasin (So), and Amber McCauley (So) took first in the 4x800m relay (11:00.11). And the 4x160m relay team of Clarice Maes (Fr), Lauryn Hodge (Fr), Katie Meyr (So), and Trinity Thomas (So) won with a time of 1:33.32. It was a great day to be a Mustang! Author Coach PlunkettPosted on March 19, 2016 Categories Track & FieldLeave a comment on Girls Track wins 12th straight conference title! Individual DGS results from the Mar.18 WSC Gold Conference Indoor Championships can be found on the Schedule/Results page. On the schedule, the link for RESULTS includes all of the individual events. The link for SPLITS includes relay splits for the 4×800, 4x200m and 4x400m relays. Full meet results with all teams can be found HERE. The Thu-Fri, Mar.17-18 West Suburban Gold Conference meet line-up for all DGS athletes can be found HERE. The bus for Thursday pole vault competition will leave at 3:30 pm. The bus for Friday’s events will leave at 3:00 pm. Author Coach PlunkettPosted on March 15, 2016 April 8, 2016 Categories Track & FieldLeave a comment on Conference Line-Up Revealed! The DGS Girls Track & Field team will travel to Addison Trail HS on Friday, March 18 to compete in the West Suburban Conference Gold Division Championship meet. The Mustangs are looking to defend their conference title for the 12th straight season! The pole vault competition will start things off on Thursday at Morton HS. Author Coach PlunkettPosted on March 14, 2016 Categories Track & FieldLeave a comment on Conference Week! Mustangs 2nd out of 24 teams at Proviso East! On Saturday, March 12, the Mustangs traveled to compete at the 24-team Proviso East Invitational. The girls represented DGS well, placing 2nd on both the F/S and Varsity levels. DGS crowned 3 individual champions in the meet. Olivia Duax (Fr) won the F/S 1600m run with a great time of 5:36.58. Fellow freshman, Becky Versaskas, won the varsity 800m run in 2:21.00. Shaliyah Dixon-Tucker (Sr) capped off the first place finishes by winning the 55m hurdles in 8.31 seconds. All individual DGS results from the Mar.12 Proviso East Invitational can be found on the Schedule/Results page. On the schedule, the link for RESULTS includes all of the individual events. The link for SPLITS includes relay splits for the 4×800, 4x200m and 4x400m relays. Author Coach PlunkettPosted on March 13, 2016 Categories Track & FieldLeave a comment on Mustangs 2nd out of 24 teams at Proviso East!